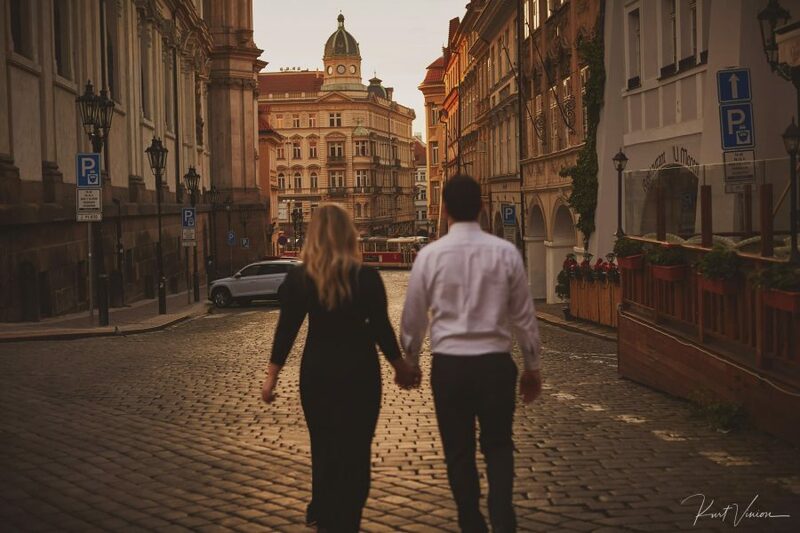 Are you wishing to have a romantic sunrise engagement photo session in Prague? 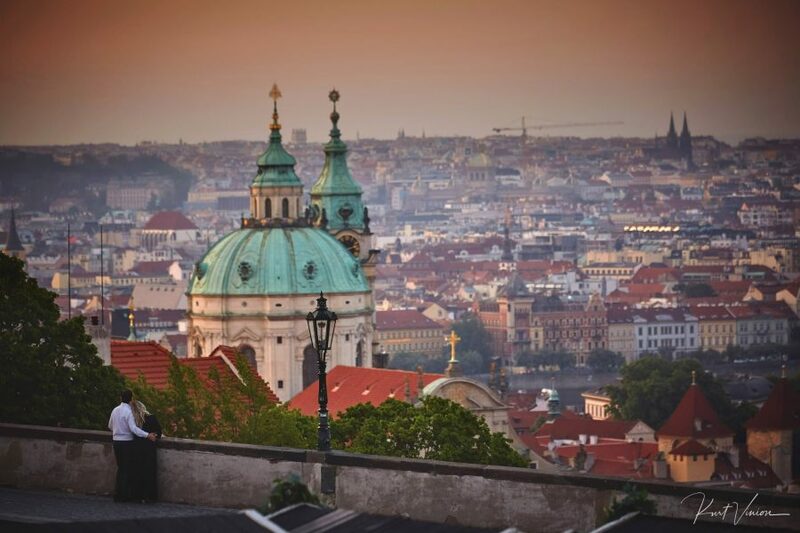 Not only is Prague one of the most visited places in Europe it is also one of the most romantic. 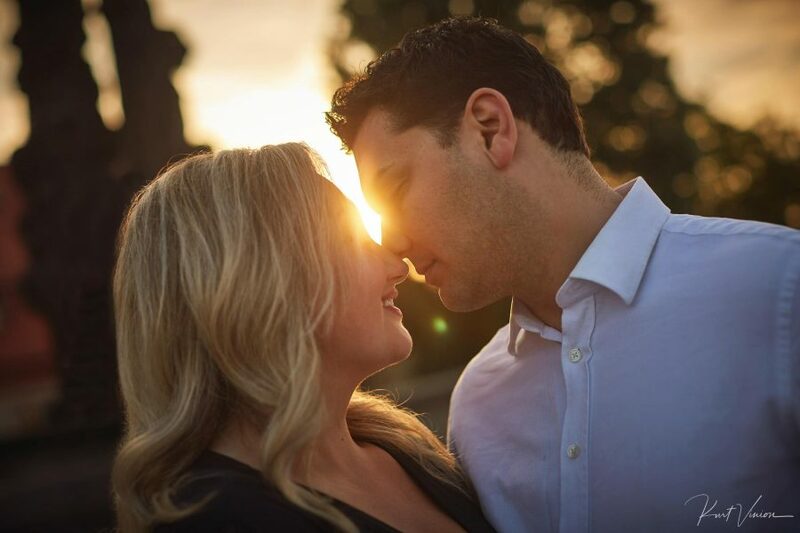 With it being in the top 10 places to visit, it is packed with people in the summer months which can be very frustrating for couples who wish to have a peaceful, intimate engagement session. Truth is, if you do mind having many people in your photos (and of course the photo bombing) you really need to consider having a very early sunrise session. Christie & Micheal are one of our couples who braved the early morning wake up to have their pre sunrise session. They came over from the US for their European vacation and they liked the idea of starting at Prague Castle where you can watch the sunrise breaking above the City of 100 Spires and so on a cool summer morning as the sky flared above us we met for the first time and immediately hit it off. After a few moments of getting to know each other better it was time to take our journey. The idea, just walking around and enjoying yourself in a natural laid back way. Some couples wish to have some posed images while others are more interested in being naturally photographed – truth is, it is up to each couple as it is their session. 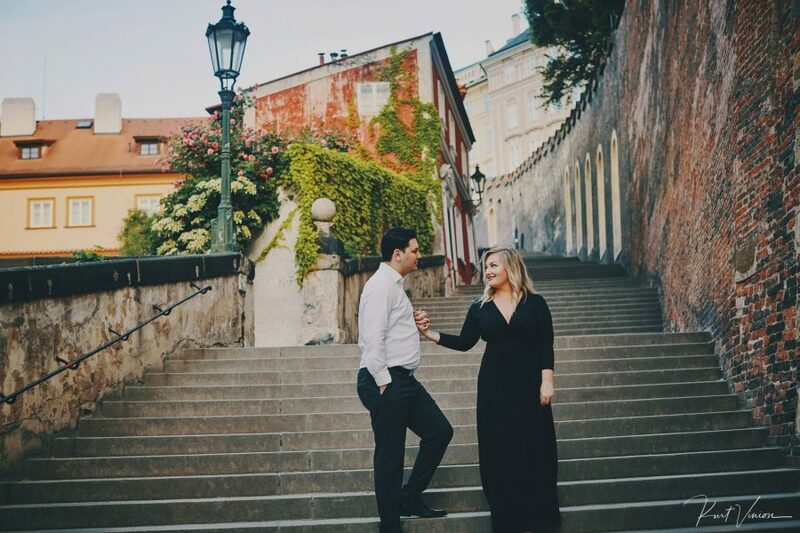 As Christie & Michael made their way down the steps you can tell that they loved the peace and quiet and having one of the most beautiful cities in Europe as their backdrop made it all the more exciting and yes, romantic. When we did arrive to the Charles Bridge the other end was already filling up with couples and many photographers but on our end it was still very peaceful and quiet and that is where some of their favorite images were captured. Truth is you can spend several hours on the Charles Bridge as it offers so much or you can try to explore more places but these two were very happy with the very laid back pace and wanted to really take it all in. People often ask, how long should our session take, when should we start and how do we get around? Truth is, you can devote as much time as you wish (90 minutes, 3 hours and even 6 hours), but if you are looking for something truly magical, without feeling rushed and without having people interrupt those wonderful moments – having a sunrise session is one of the most unforgettable moments you will have. You can also enjoy the most creative and artistic time which we lovingly call the Golden Light Hour (my personal fave) and then top it all off at a garden or a different location as time allows. 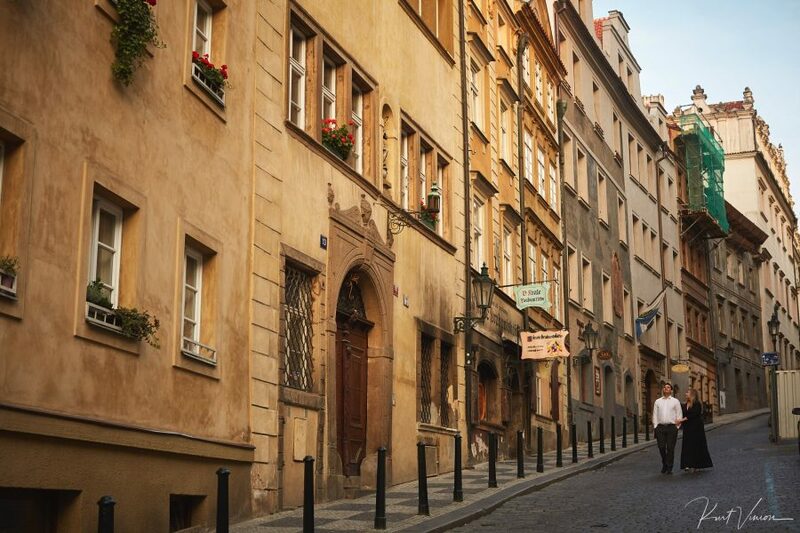 And yes, we walk, it is the only way to enjoy this city, to explore its cobblestone alleys, or spend an hour on one of the most famous bridges in the world. Truth is, these sessions are designed to move you, impress you and blow you away. Creating these beautiful sessions that will be looked upon many years later is one of the reasons why I gave up photojournalism. Hearing the wonderful feedback from clients and how much they love these sessions is a nice bonus too. Pictured here are Christie & Michael’s favorite images from that morning where the world seemingly stopped and allowed them to be the center of it all. 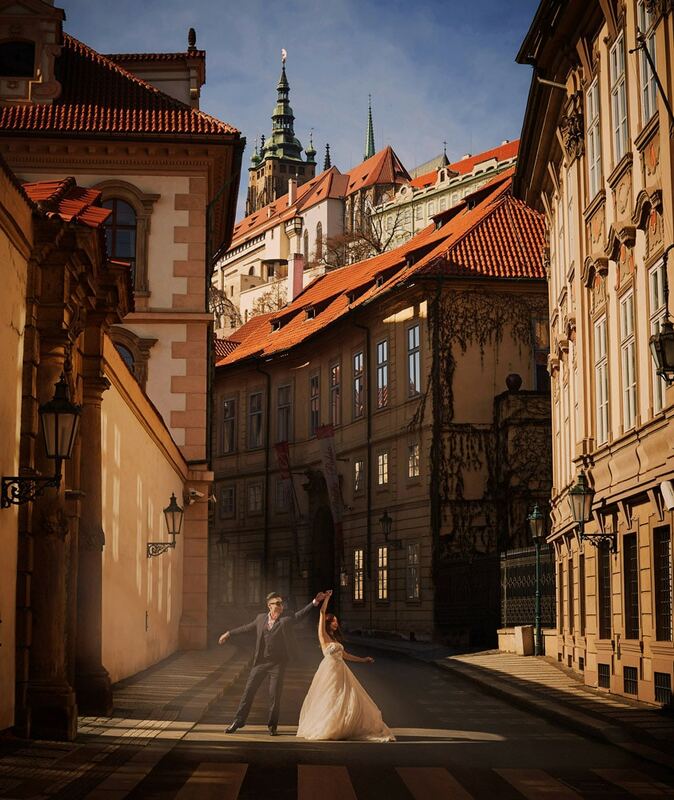 American photographer Kurt Vinion has been providing the very best in couple photography in Prague since 2008. Widely experience and well known for his creative & artistic use of light he can create beautiful, intimate and authentic images that will blow away your family & friends and will be enjoyed for a lifetime. Kurt does not just take a picture he captures beautiful moments that will be cherished. Our Natural Light Lifestyle Engagement Sessions (pictured above) start out at a cool 5000 CZK. Please describe the type of service you require, the location and the dates. For those who are wishing to have a portrait session please specify what type of session (pre-wedding / family / lifestyle) you wish to have. 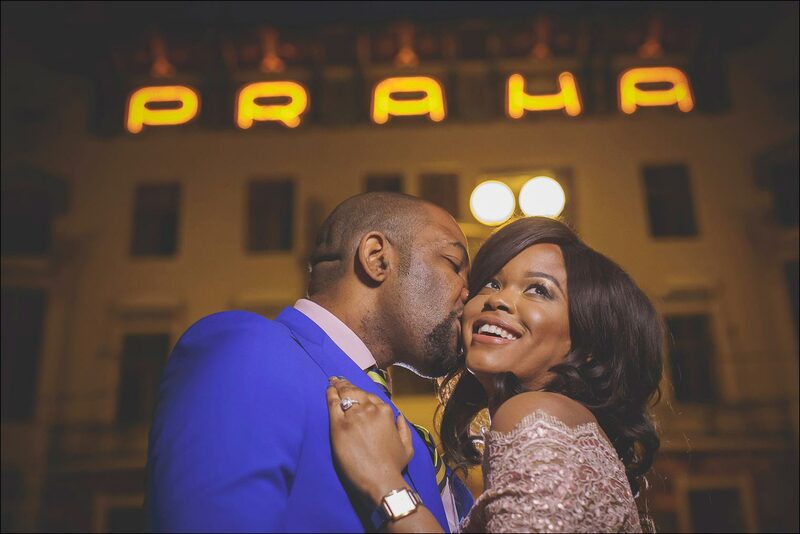 May I know the price for pre-wedding photos in 2019? I would like to check if you are available on subj date for pre wed photography in Prague and what are the available packages? I am a wedding consultant in Taiwan, and I am very much interested in your pre-wedding & post- wedding photo-shooting service in Prague. As I know, some of my customers are interested in having pre-wedding & post- wedding photo-shooting at Prague, is there any package service are suitable for my customers and what would be the fee please? Could you send me a cost overview? My girlfriend and I are traveling to Prague and are hoping to hire a photographer for a ~2 hours on July 17th to capture some of the beautiful moments during our trip and some of the wonderful sights Prague has to offer. I came across your name and thought I’d reach out to see if something like this would interest you! We were hoping to pay a visit to the major Prague attractions i.e. The Charles Bridge, Lennon Wall, Old Town etc. and any other sights would have previously shot at that would be turn out beautifully! If you’re interested we were thinking of the morning to beat the crowds! Please let me know and happy to discuss further. I am interested in the czech collection, signature art collection and elegancia collection. May I know the price? Also, I’m looking at either the spring or autumn season. Hi Ming si, thank you for contacting us – information has been sent. Hi Mr. Fu, thank you for contacting us – information has been sent. Hi Vivien, my assistant will be contacting you shortly with the information requested. Many thanks for your interest. Greetings Dennis, information has been sent. Thanks for your interest.